Most parts of the state will continue to see above average temperatures and dry weather for the next few days barring a few isolated showers. A persistent weak low pressure area/Upper air circulation is continuing to bring abnormal rainfall across Telangana, Chhattisgarh and Maharashtra. Some parts of North TN could experience overnight thundershowers on this day. 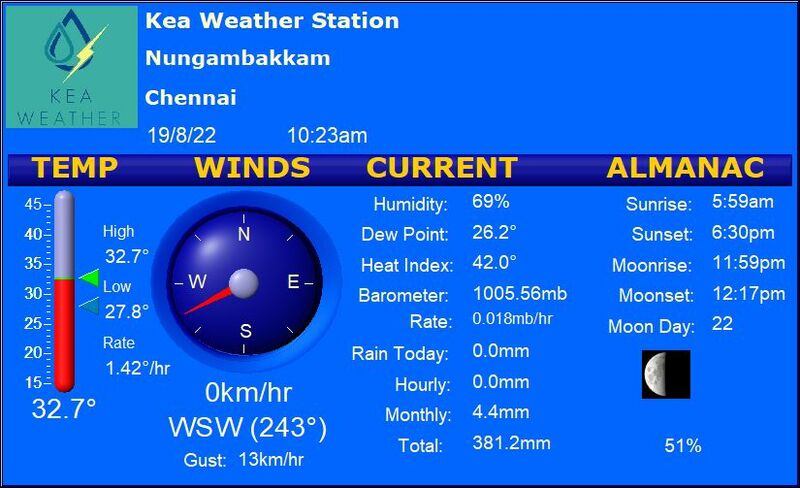 Chennai – Mostly clear with a high of about 33 degrees and a low of about 26 degrees. Late night isolated thunderstorms are possible. Trichy – Clear and Warm. High of about 37 degrees. Madurai – Some clouds and warm with a high of about 36 degrees and an uncomfortable night with a low of about 27 degrees. Vellore – Seasonable with a high of about 33 degrees. An isolated thundershower could pass over the city. Coimbatore – Partly cloudy and pleasant. High of about 32 degrees and low of about 23 degrees.